As people age, their bodies begin to slow down. Limitations caused by health conditions or social isolation can contribute to feelings of loneliness, sadness, and boredom as seniors find themselves confined to their homes or unable to do the things they enjoy without assistance. But research shows that the more seniors engage in enjoyable activities, the less likely they are to develop certain diseases, become depressed, or experience mental decline. The good news is that there are many ways you can provide entertaining and engaging activities to help keep your family member sharp and vibrant. What did your loved enjoy doing when he or she was younger? Are there hobbies they used to enjoy but that have fallen by the wayside as they have aged? 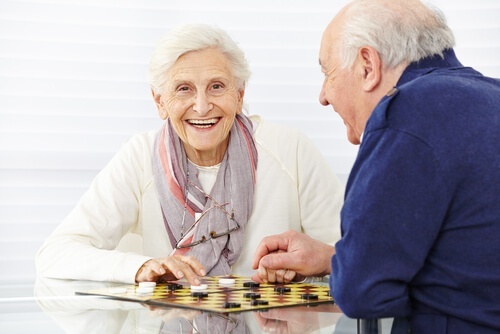 Can you help them relive those hobbies or activities in a new way now that they are more limited in what they can do? Are there specific limitations you should consider based on your loved one’s physical abilities? For example, if your mom or dad enjoyed planting a big vegetable garden every summer, perhaps you could set up an indoor herb garden on a kitchen window sill. If they loved to read but have poor eyesight, perhaps you could keep a supply of audiobooks on hand. If you’re looking for some inspiration for ways to build fun into your family member’s routine, here are some ideas to get you started. Social interaction is a wonderful way to help your mom or dad overcome feelings of isolation and loneliness. There may be groups or clubs they can join that offer opportunities to have fun with people their age, or family members may be able to stop by and take them for an outing. Safety always comes first—Consider safety not only in terms of potential falls or health risks, but also in terms of being aware of surroundings. If your loved one is participating with an unknown group or going to a new social activity, ask a family member to attend with them the first few times. Don’t push too hard—If your mom or dad doesn’t want to go out, don’t force it. Find enjoyable activities they can do at home. Remember, the goal is for them to have fun, not to check an activity off your list. Offer companionship—Sometimes the most important thing seniors need is someone to talk to. Visits don’t always have to be centered on activities. If family members all live far away, a home caregiver can stop by several times a week to sit with your loved one, play games, or just chat. Helping seniors find new ways to enjoy life when they can’t do all the things they used to do can be challenging. Sometimes the best way to encourage them to stay active both mentally and physically is to have someone stop by regularly to talk and interact. If family members are unable to do this, hiring a home caregiver is an excellent solution. If you’re ready to learn more about how home care can give your senior loved one the safe, enjoyable life they deserve, download our free Guide to Home Care.